Yesterday, I decided to dump "nice sounding" for "more effective". I looked back at my life. I remembered 2004 when I decided to start reading at least a verse of the bible a day. It was the second toughest decision of my life, tougher than even quitting my job. Only second to my decision to pray every day. I remember the numerous midnights I would suddenly jump out of my bed to pick my bible and read, by candle light or my Nokia 3310 backlight, just one verse of the bible. Everyday, then, my biggest accomplishment was reading at least a verse of the bible. As usual I grew steadily, and ended up reading the bible thrice in about 3 years. I have once read Job in one sitting and 2 other old testament books that same day. Then I moved from at least one verse a day to 1 chapter a day, and then to 3 chapters a day. And began telling everyone that cared to listen, "Guess what? I read three chapters of the bible a day." At that rate, I read each of most of the new testament books in 2 days and the entire new testament in a couple of weeks. But never the old testament. In fact, since the 3 chapters a day decision I have ended up reading Paul, Peter and John's letters over and over. I avoided the books with lengthy chapters and less conversational verses. I avoided almost all the books in the old testament. By making a more nice sounding rule of 3 chapters a day I ended up reading less of the bible and more of the same chapters I found short and interesting. Now I'm going back to one chapter a day and maybe start from Genesis. I went for Toastmasters West Africa district conference on Friday. A lot of the participants were from the francophone countries (Burkina Faso, Togo, Benin and Cote d'Ivoire) and were having trouble at the conference registration stand. I decided to help and found out that my French is even worse than it was 3 years ago. So on Saturday morning, I picked up my french self study book and found out that I was at page 31, chapter 4. 54 days ago, I gave my self the lofty goal of reading a chapter a day. The 3 days I was faithful were not happy days for me. I had set a goal that will no doubt make me advance very fast in my french language learning but will also make the journey a very miserable one. So I decided to drop the goal to one page a day. Realizing that if that was my initial goal, I would have read 54 pages by now and not feel exhausted after each reading. And then I looked at the other aspects of my life that I have been setting too ambitious goals and limiting my own growth/efficiency. And in a few minutes, the 3 bible chapters a day came to my mind. 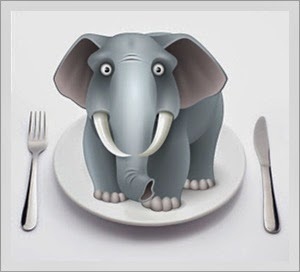 Now I'm going to eat my elephant one bite at a time. Not a big bite that will always give me trouble to swallow and make me dread the next bite. But a small bite I can swallow and look forward to the next bite. And I'm going to apply this principle to every aspect of my life. Going to take one day at a time, and one small bite a day. Like I'm doing with my blog posts. I have written 145 posts already this year on just this blog by writing one post a day. Luckily, it has not been a choking bite. I'm now even beginning to look forward to each day's post. Every morning, I check my emails at past 8 to read my own post and wonder what I'll post for the next day. I see it as my ultimate way of living one day at a time. So if you've got an elephant to eat. A goal so big you are tempted to get a big shovel. A project so big you are often overwhelmed. Don't make any big resolution. Drop your shovel. Get a table knife and fork, and eat it one small bite at a time.